Los Angeles-based Reformation is a brand that definitely knows the importance of sustainability. They’ve also got style…which sets them apart from most sustainble brands out there who usually take on a more minimalist approach in fashion. Not that there’s anything wrong with that, but I’ve noticed many of these brands start to look a bit similar after awhile. Reformation states that they “source the most beautiful and sustainable fabrics possible” to quickly create “effortless silhouettes that celebrate the feminine figure.” By ‘quickly’, we mean converting a drawing into a garment in about a month while most designs take about a year or so. Fit is given a lot of attention to in order to make sure everything made is flattering and worth your dollars! Reformation also pays attention to all sizes, with petite and plus size lines which are soon to be expanded even further. Reformation has “Ref standards” as they call them, which are “different classifications based on their combined social and environmental impact.” The way the brand explains this is so perfectly put that I’m just going to quote them here…”We tried to make these standards as holistic as possible, taking into consideration water input, energy input, land use, eco-toxicity, greenhouse gas emissions, human toxicity, availability and price. We also looked at garment care implications, like microfiber shedding.” Sustainability happens at the raw materials stage, which determines how it is to be washed as a garment and even recycled. Reformation has five categories for raw materials determining their sustainable viability and aims for 75% of their garments to meet the top two best. If you’re curious, you can read more about their fiber standards here and methodology/sources here. I’ve written about TENCEL™ Lyocell a lot on my blog, as many denim brands use it in their fabric blends due to its amazing softness, stretch, shape-keeping properties and sustainability factor. It’s part of the Rayon family, made from renewable wood materials from fast-growing eucalyptus trees and a favorite over at Reformation. It doesn’t need pesticides and uses a lot less water (80% less) and land to process than cotton since eucalyptus trees don’t need irrigation. REFIBRA™ blends recycled cotton waste with wood pulp to produce new TENCEL™. Viscose is also used for much of Reformation’s woven fabric, which is made from wood pulp as well, and the brand works closely with Canopy to make sure all wood comes from sustainably managed forests. Reformation also uses TENCEL™ Modal, which also comes from wood pulp sourced from sustainably managed beechwood forests in Europe, with a fiber yield of 2 times more than that of cotton plants. These trees also require less fertilizers. Linen is an antibacterial, soft and light fabric to the touch, which uses no water and produces a quarter of the carbon as cotton per pound of fiber. Reformation’s linen is made in mills that are Oeko-Tex 100 certified. This amazing brand also uses recycled cotton, organic cotton, Recover® yarns which are made from discarded clothing and other fabric waste, ECONYL® regenerated nylon, recycled cashmere, alpaca (highly renewable and lower environmental ipact than most sweater yarns) and Deadstock & vintage fabrics which is purchased textile waste from other factories, designers and vintage apparel wholesalers. Hence Reformation’s name, 2-5% of their items are made from vintage apparel. I realize this is a lot to take in (and it was a lot to type concisely)…but can you really get much better than all of this? To top it off, everything is ethically made locally in Los Angeles. 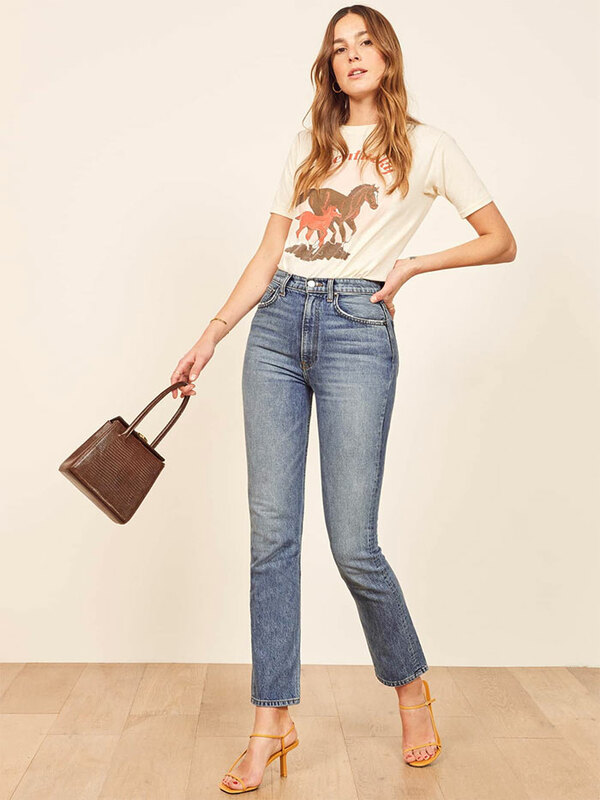 Reformation isn’t just a denim company, and carry full lines of all kinds of pieces for your wardrobe. But for this post (because I am having trouble keeping it from being too long right now), here are some of what I feel are the best examples of denim that Reformation has to offer! Shop the entire denim collection at Reformation here.